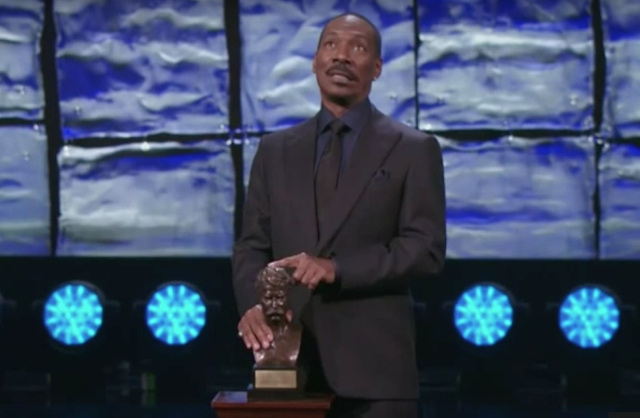 On Sunday Comedian Eddie Murphy won the Mark Twain Prize for American Humor. During the award ceremony at the Kennedy Center in Washington, D.C., Murphy gave us an impression of another famous recipient of the award - Bill Cosby (2009). At 2:27 in the image below Eddie Murphy continues, "Bill - Bill has one of these." Immediately after he says "these", we see Murphy display an excellent example of a microexpression of a "Mouth of Fear" (During 2:30). Moreover this expression is highly asymmetric, essentially unilateral (Murphy's left). As obvious as this body language tell may seem when it's isolated and highlighted in this case study - the vast majority of the time it's completely overlooked in day-to-day interactions. If you observe carefully, you will also see involvement of Murphy's neck muscles. And although both neck and mouth components are manifested here, sometimes only the neck displays this subtle sign of fear. Nonverbal Communication Analysis No. 3345: Vladimir Putin, Barack Obama and a Handshake at the U.N.